CANBERRA, -- Austal is pleased to announce the launch today of the sixth in-series Cape Class Patrol Boat (CCPB) at the company’s Australian Defence Facility in Henderson, Western Australia. The launch of Cape Leveque marks the third year in a row a CCPB has been launched in the first week of January; preceded by Cape St George (CCPB01) in 2013 and Cape Byron (CCPB02) in 2014. 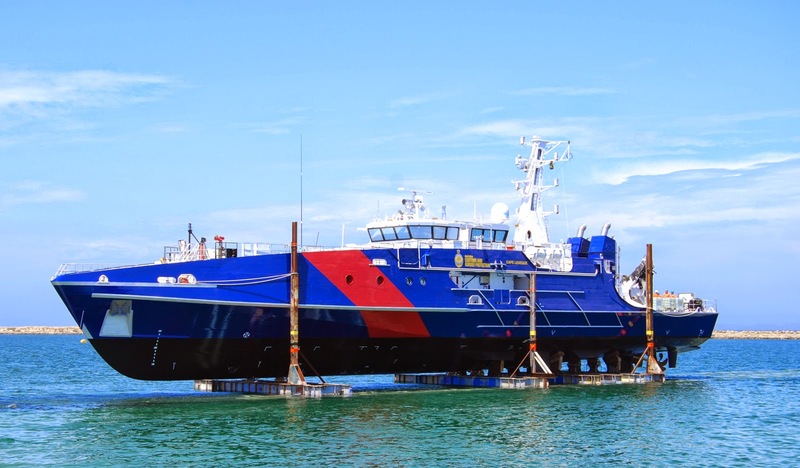 Cape Leveque is the sixth of eight 58-metre patrol boats that are being delivered to the Australian Customs and Border Protection Service (ACBPS) by Austal as Prime Contractor under a design, build and in-service sustainment contract, valued at approximately $330 million. Under the contract, Austal is also using its in-house expertise to develop and integrate sophisticated electronic systems for command, control and communication. The launch ceremony marked the first time the boat has been lowered into the water. Following maritime tradition, specially minted coins were placed under the keel block of the vessel as a symbol of good fortune at a Keel Laying Ceremony on the 31st March 2014 attended by then Minister for Immigration and Border Protection, Scott Morrison, MP. The coins were removed prior to the launch and will be presented to the boat, ACBPS and Austal at a later date. The boat was lowered into the water using Austal’s slipway facility. With the vessel in the water, Austal is on target to achieve full vessel completion and sea trials prior to an official naming ceremony and final delivery to ACBPS in mid 2015. Meanwhile the remaining three Cape Class vessels are at various stages of construction and will be delivered progressively through to end of 2015. Cape Leveque is a state of the art maritime defence capability that will play a significant role in protecting Australia’s borders from multiple maritime threats. It has been designed to have greater range, endurance and flexibility - as well as enhanced capability to operate in more severe sea conditions and across longer range - than the current fleet of Customs and Border Protection vessels and indeed the Royal Australian Navy Patrol Boat fleet. Apart from the Cape Class Patrol Boats, Austal is prime contractor for three major defence Programs: the Littoral Combat Ship (LCS) and Joint High Speed Vessel (JHSV) Programs for the United States Navy and two High Speed Support Vessels (HSSV) for the Royal Navy of Oman. Australian Customs and Border Protection Service Cape Leveque Cape Class Patrol Boat.